An integration is no place for on-the-job training. There's too much on the line. Consolidating two companies isn’t anything like running the day-to-day business. 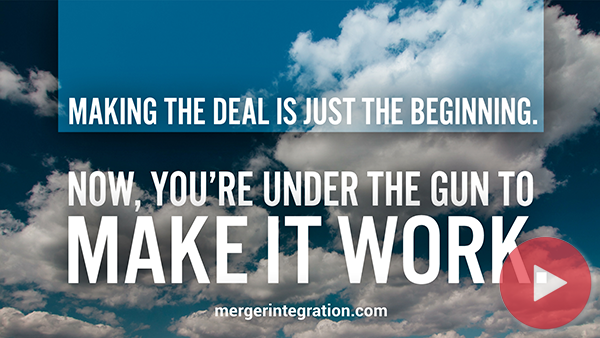 There's little in the routine operation of a business that prepares its managers to run an M&A integration. Even crusty, battle-scarred, seasoned veterans with years of experience under their belts can be rookies in this situation. It's not enough just to throw your A-Team at the integration if they have to essentially feel their way along. Undoubtedly they will give it their best effort, but it is like they are playing a game of organizational Russian roulette. They are relying on good luck and if they don't get it, the consequences can be grave. Integration team members may not receive a second chance to make the consolidation work. At the very least, their learning curve is likely to lengthen the transition period at a point in time when additional days, weeks, and months are directly translated into lost productivity and perhaps, many millions of dollars wasted. We recommend training, such as the Merger Integration Certification Workshop, that level sets everyone with the same information and teaches many specific "how to's." Without this type of orientation, integration leaders typically argue over who's right, get in each other's way, and generally just tangle things up. However, some expert education on the front end can bring both the knowledge and the alignment necessary for a well-orchestrated integration.